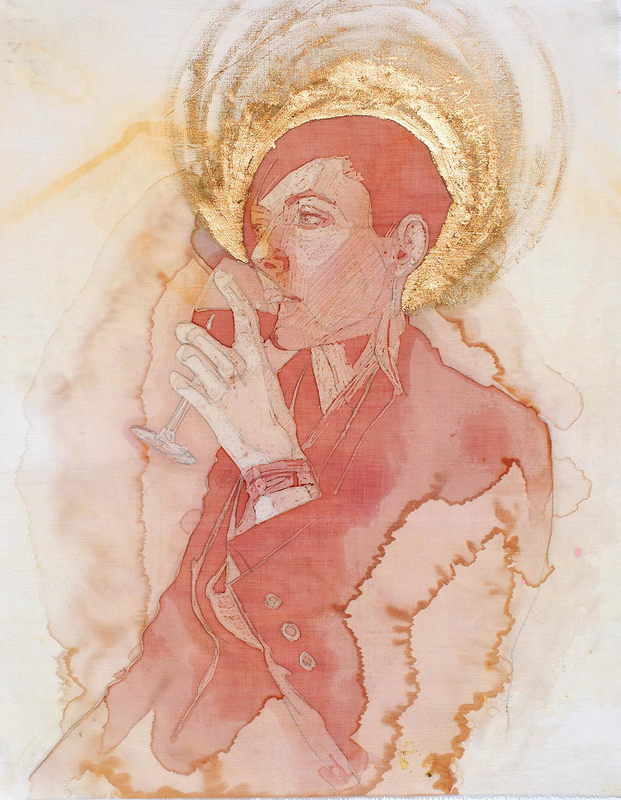 “Our own lives are short, and the wine stains are to be enjoyed and loved as highly distinctive works of art.” Amelia Harnas creates wine stain portraits. A delicate work, due to the unique nature of the medium. On the other hand, the fact that they are made of wine is why they are appealing. A fragile work that embraces creativity, nature and volatileness. Q: Let´s warm-up: wine is devilish or celestial…? A: This question makes me think of the classic devil over one shoulder and angel over the other, arguing back and forth. To me, wine is mercurial: a heavenly trickster. I have so many rosy memories at the bottom of bottles and have cursed those same bottles a good number of mornings, nonetheless. 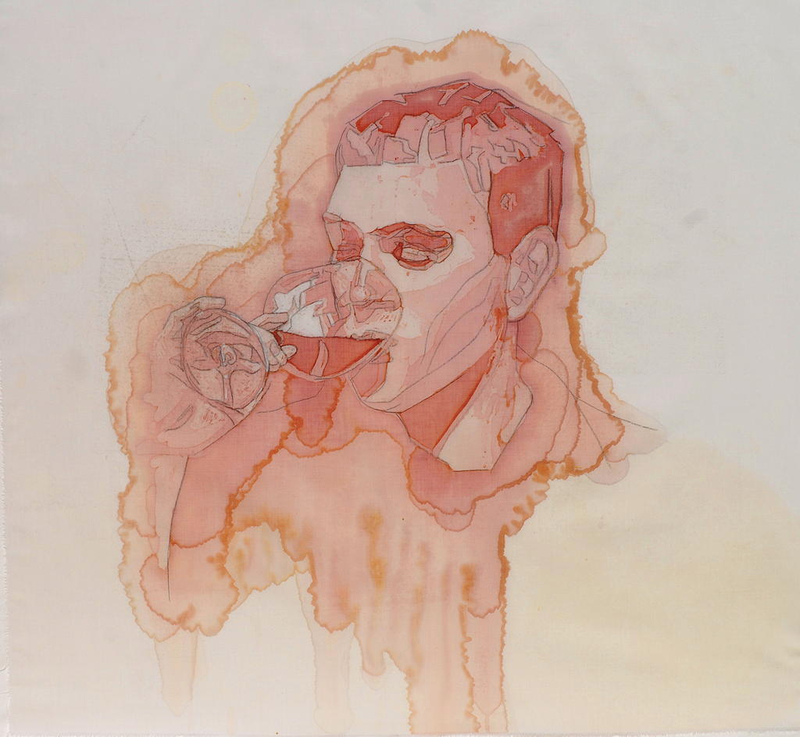 Making the wine stains, I know its trickster nature all too well. It seeps into spots I thought I had covered and bleeds all over the place. But when a portrait turns out beautifully, I definitely feel like I’m on cloud 9. 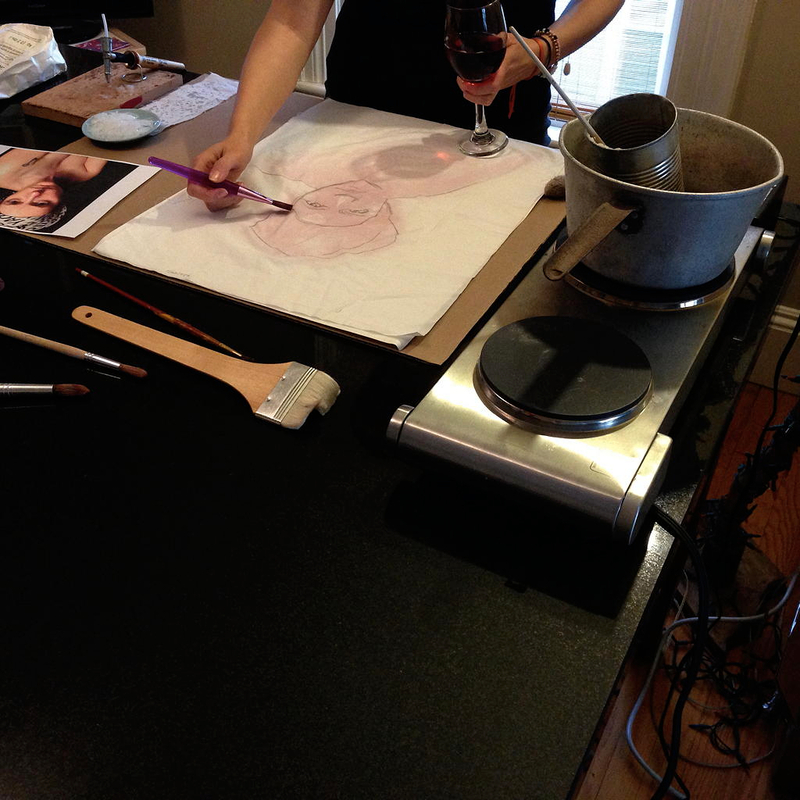 Q: Why do you prefer to paint with wine? 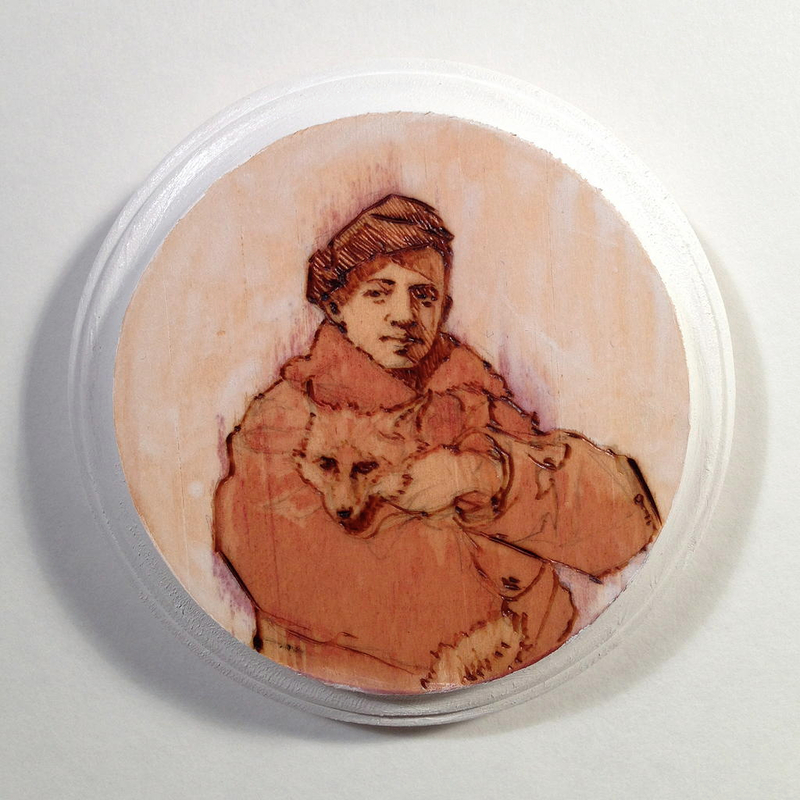 A: Not many artists can say they can ingest their artistic medium without serious consequences. 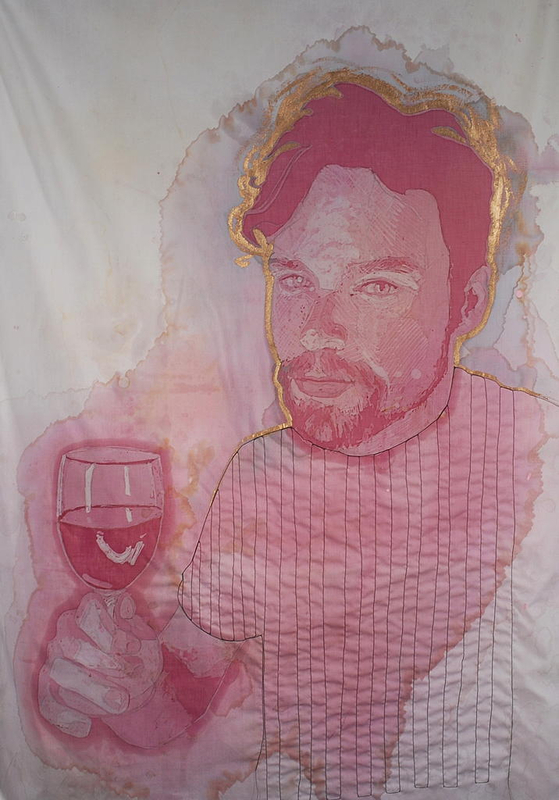 I get a lot of comments, “Oh, but what a waste of wine!” For the record: 1)) I can make three or four portraits from only one glass of wine. 2) I only use bottles of wine under $10. 3) If you do the math, the majority of bottle of wine remains for me & my beau to drink. 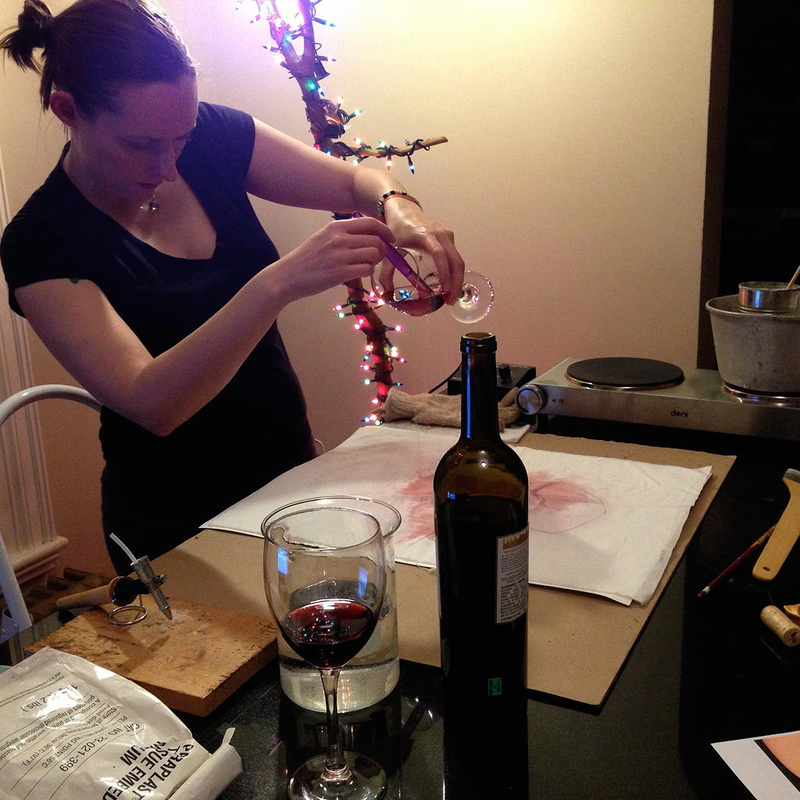 If anything, I have to remember which glass is my painting wine and which is my drinking wine! A: I’ve discovered old vine reds from Europe are often the best, and I’ve had success specifically with Cahors /Malbec . However, I don’t make too big a deal out of it. Generally, convenience & low price points win–especially if it’s just the end of a bottle that’s been open for one day too long. Q: And there is a certain fragility of your artwork. Is this an expression for imperfection and volatileness? A: The wine stains certainly capture the ephemeral qualities of living on this planet. I think it exemplifies the old adage: this too shall pass. Of course, I do what I can to preserve the stains as long as possible, and for some of them, at the very least, the embroidered drawings can outlast the stains. All the while, I have a deep respect for their fragile qualities. Not all art is meant to last centuries in marble museums. Even then, the point of visiting a museum and standing in front of an old master painting is to cherish that fleeting moment you have face to face with it. Never underestimate the value of the ephemeral. 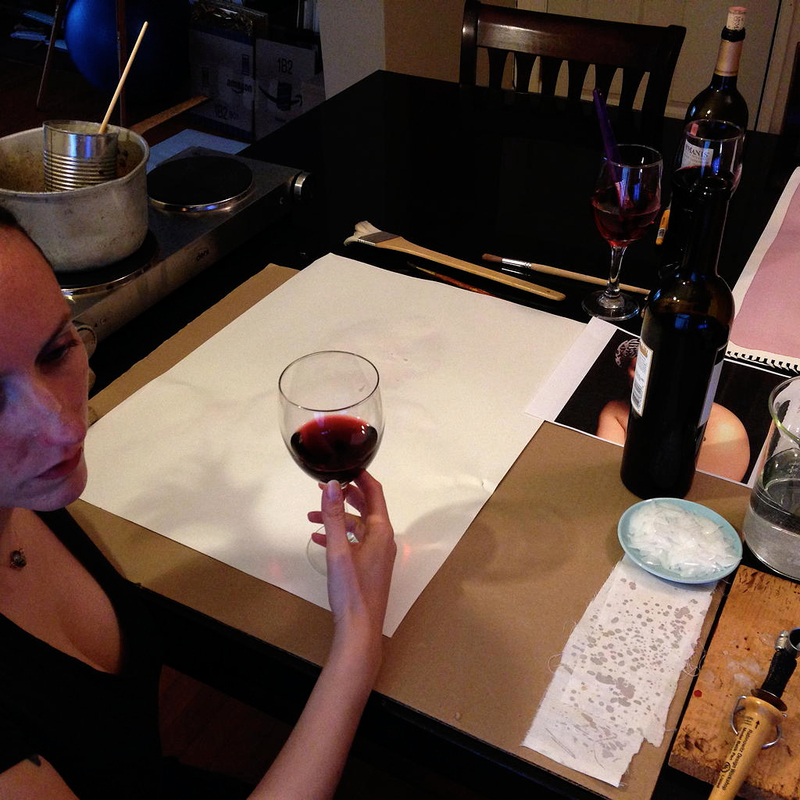 Q: Did your perception towards wine change since you integrated it into your artistic process? 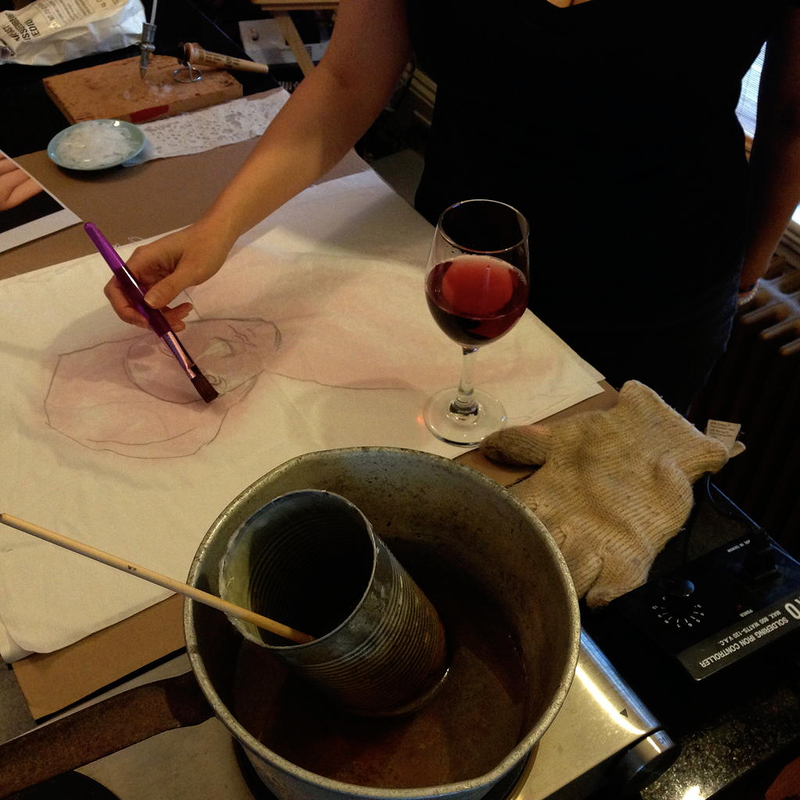 A: I’ve come to really love the aromatic aspect inherent in the wine stain process. After a day of making wine stains, my studio is filled with such a beautifully pungent scent. And so, now t he fragrance of a glass of wine is linked to the idea of making artwork . It stimulates a whole other part of my brain, conjuring feelings of industriousness and catching creative sparks. Q: Natural wine is currently a hot topic. (Wine without any chemical treatment.) Would this type of wine change the perspective of your creativity approach? A: I have very little experience with natural wine, to be honest. I’d definitely be curious to try it out. 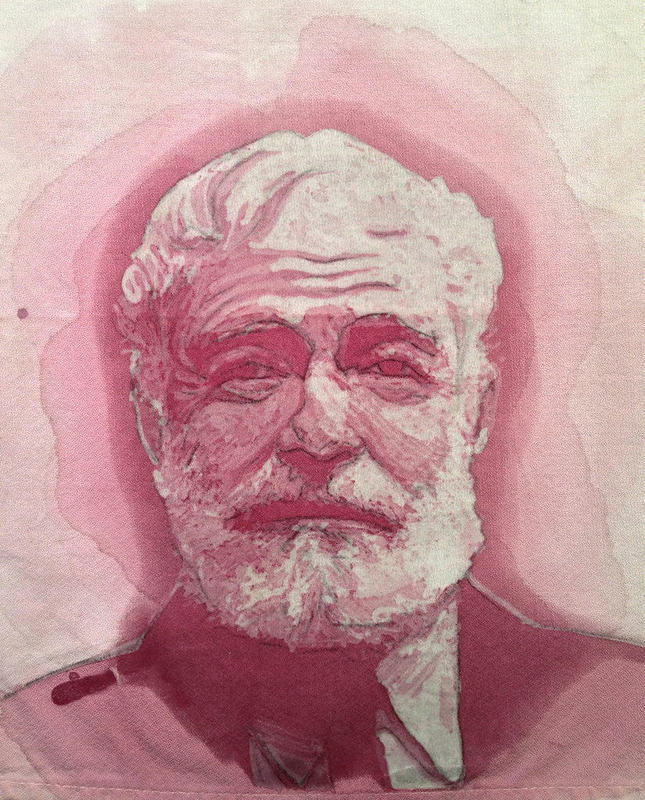 In general, I do enjoy the simplicity of the wine stains: just cotton, wax, and wine. After painting with oils and alkyds, with all of the spirits of this and gums of that, it’s a relief to work in a more uncomplicated way. So we’ll see if natural wine plays into future stains. 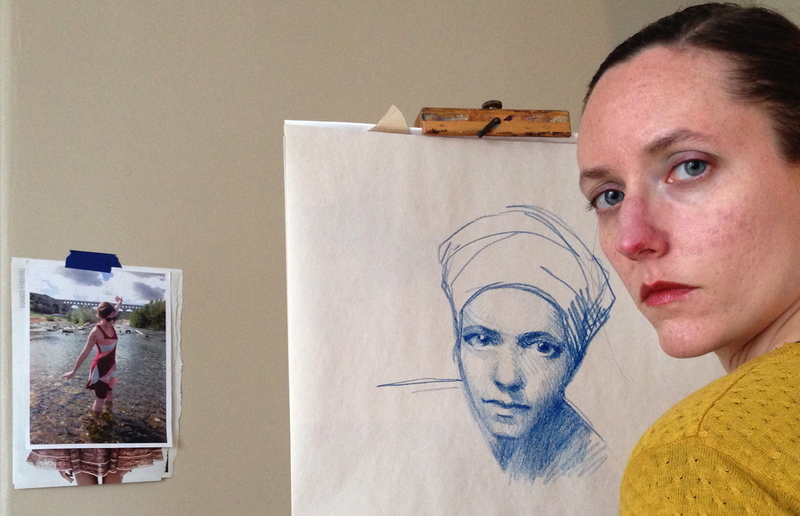 Q: Your work is heavily inspired by faces. 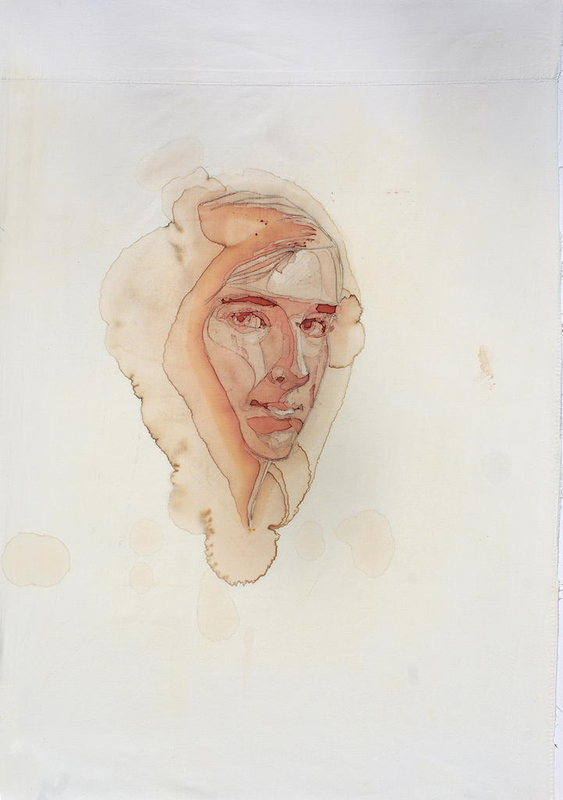 Which face do you like to paint with wine but the result would not suit into your concept? A: The wine stains can easily feel very bloody. There were a couple of instances where I was asked to do commissioned portraits of people who had passed away, and when I discovered the deaths were due to tragic circumstances (a car accident, for example), I couldn’t bring myself to do it. It was just too intense. 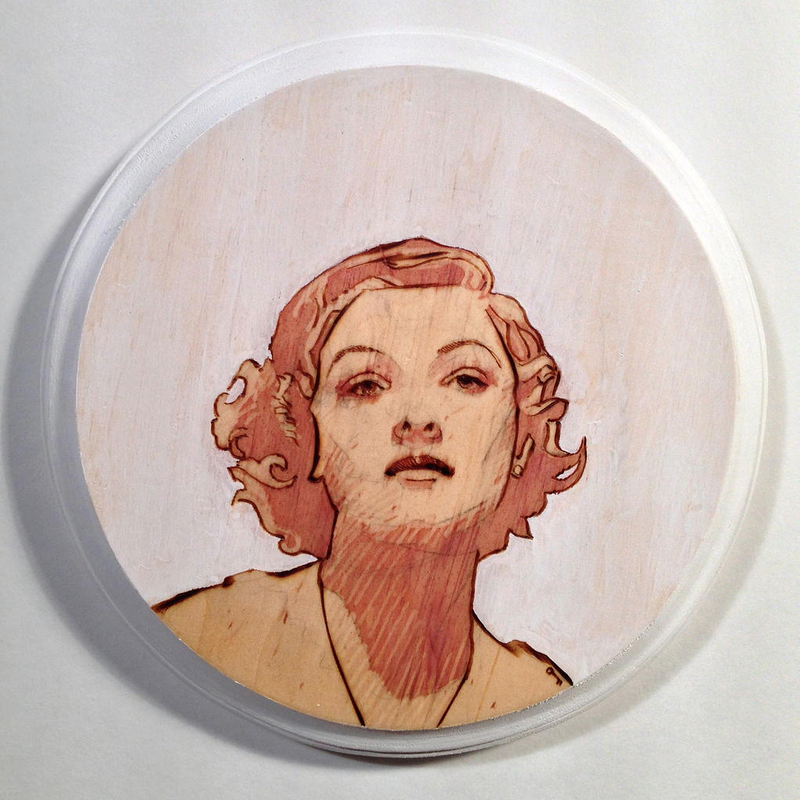 Of course, I’ve done portraits of Hemingway and Joan of Arc, who both had tragic ends. For some reason, however, it seems different: for Hemingway, I would like to think he might be amused by the irony, and Joan might simply see it as a form of communion. Q: Do you have any ties to the wine or culinary industry? A: I have never directly worked in the wine or culinary industry; however, my beau is a top-notch craft cocktail bartender who has a brain for booze facts. I’d be remiss if I didn’t consult him every once in a while for his opinion on various bottles of wine for the stains. Of course, not many people have many questions for him about exactly what color the wine is in a bar setting! Is it a deep burgundy with hints of indigo or a rusty terracotta? That stumps him from time to time. Q: Your favorite wine please! A: I am quite partial to the Pacific Northwest Pinot Noir. I lived in Portland, Oregon for a while and had the privilege of having access to some really lovely wine. Specifically, I once drank a sincerely delicious glass from Archery Summit. However, having grown up in the Finger Lakes region in upstate New York, I also have enjoyed many a glass of Riesling with good friends at parties. Sometimes a regular old bottle of wine can taste just as good as high class wine when you are with the right people at the right time. A: Go with the glow.